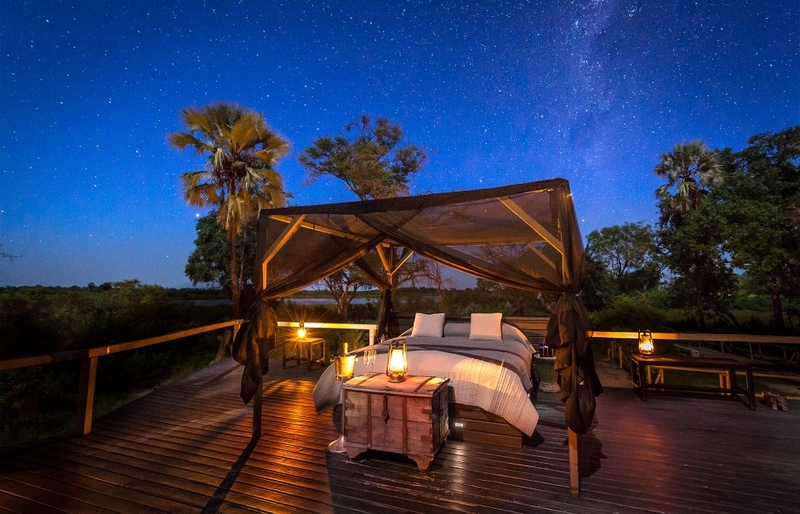 There are few experiences more romantic than a luxurious sleep out somewhere in the wilds of Africa, with only a mosquito net separating the safari-goer from the canopy of stars above. Yet our experience of a night literally out in the open went way beyond the sentimental thrills of safari. It touched us deeply, stirring something in our souls. 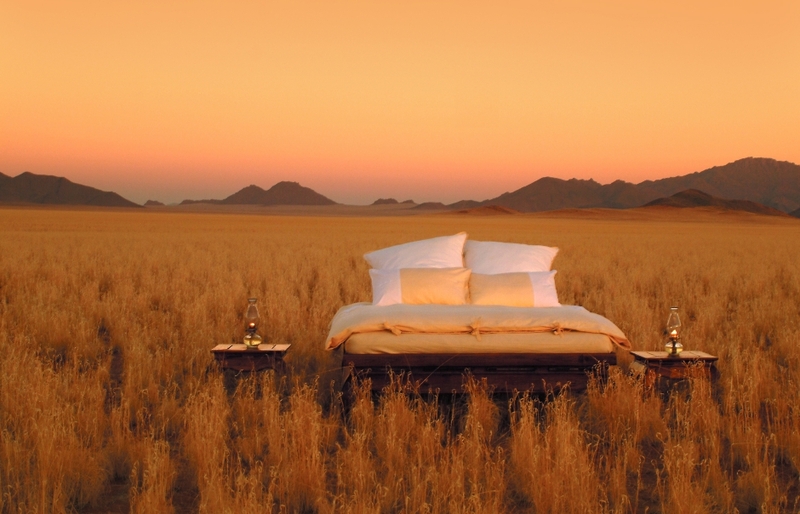 We experienced a star bed night in the Namib desert, in Namibia’s Sossusvlei. Enveloped in the silence of the night and the cosmic glow of the sky, we felt a profound sense of connection to the wild African nature, and by extension to the ancestral roots of humanity. An experience that taps into a subconscious collective memory? It really can be. But, spiritual musings aside, what exactly is a star bed? It’s not simply camping out, or sleeping outside. Be it a rooftop bed, a treehouse or a lakeside camp—it is a whole experience that comes with candle lights and champagne and maybe a picnic dinner prepared by a 5-star chef. It takes a small team to prepare. At the best luxury lodges, there is no sacrificing of comforts. We partner with Kiwi Collection to bring you an inspirational selection of the amazing star beds. These are listed in no particular order—any one of them are worth adding to your next year’s travel plans. 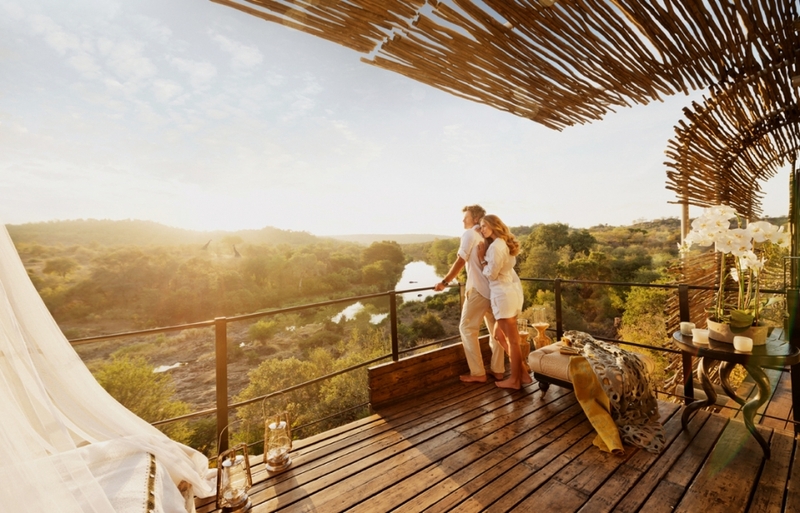 We kick off with the beautifully designed Lion Sands lodges, set up by the Sabie River in the bushveld of South Africa. The unique attractions of Lion Sands are three tree houses: the Tinyeleti, Chalkley and Kingston. 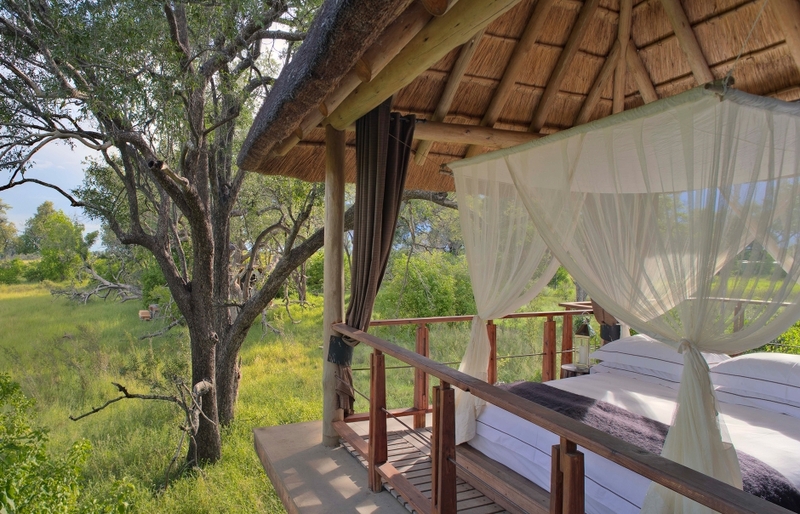 They are effectively open-air bedroom suites built on stilts in the bush, each set up with secure access and as many of the modern comforts as possible. 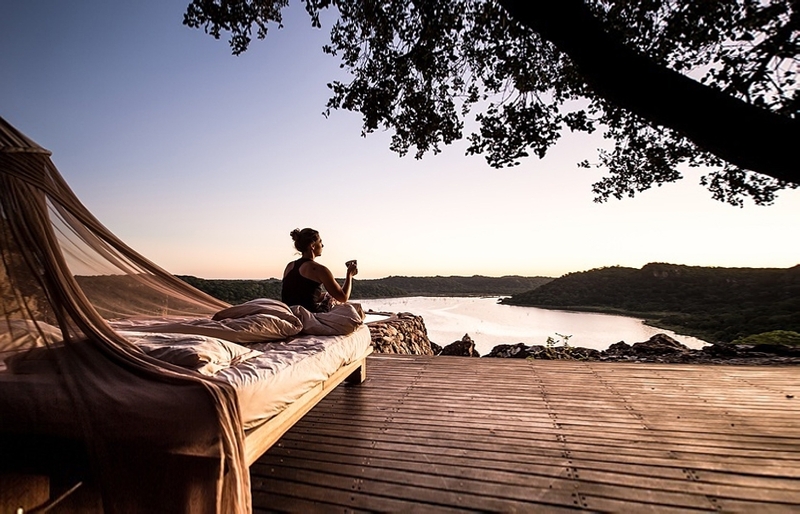 A double bed draped in a mosquito net, Persian rugs underfoot and a bottle of champagne on ice await the lucky guests who come to enjoy the unforgettable sleep in the wild, surrounded by the night sounds of Africa. 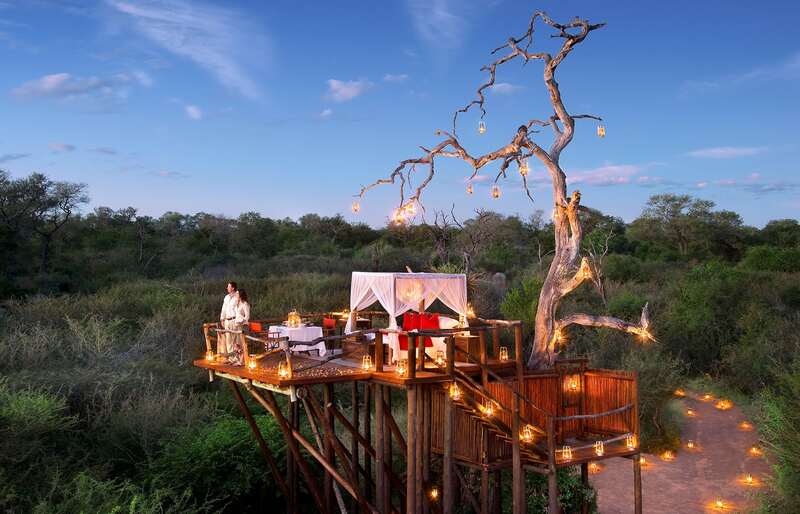 Read our review: Lion Sands Private Game Reserve, South Africa. Luxurious, organic, tranquil and remote… this is a place in a league of its own. And from among all the fixtures of the Little Kulala, their under-the-stars “bedrooms” are the most exquisite. This is where we had the fortune to spend a night under the stars. 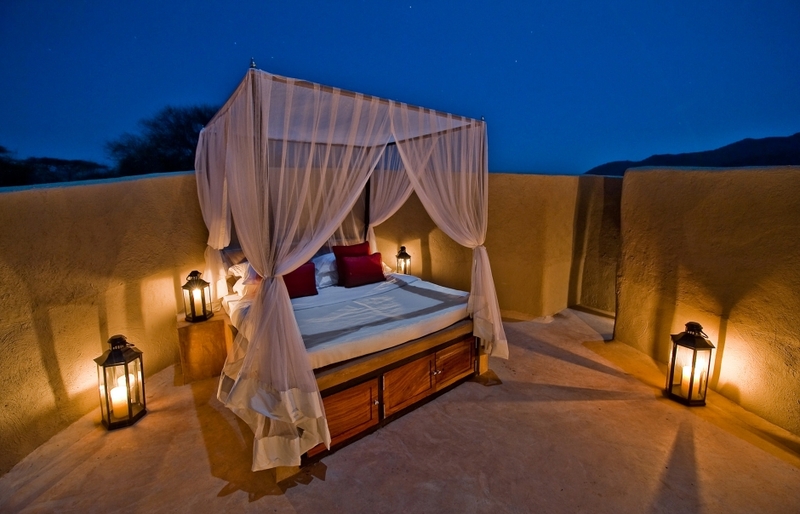 The lodge’s crew set up a bed on the flat roof of our desert cottage, with lanterns and champagne and extra blankets. The skies were perfectly clear—with civilisation too far to cause light pollution—and the silence of the Namib Desert was absolute. Despite having behind us a busy day of exploring the amazing Deadvlei, the night sights were too awe-inspiring for us not to stay awake. We were gazing and whispering to each other long into the night. Read our review: Little Kulala. 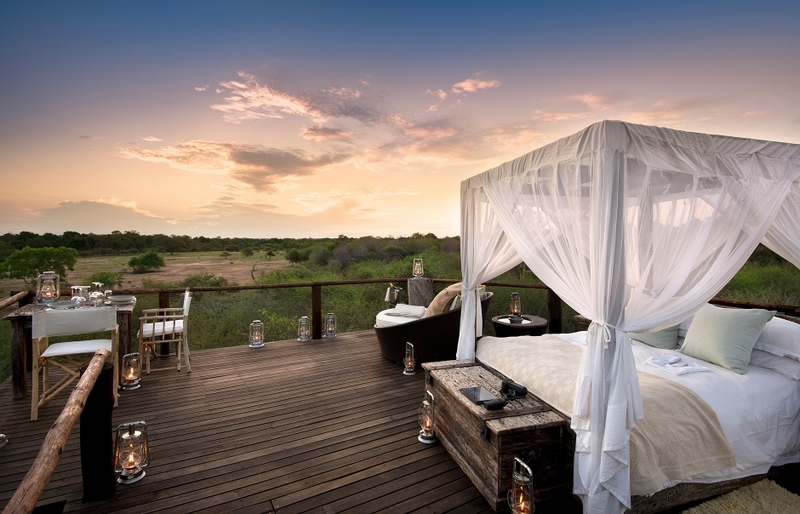 Singita is one of the most respected brands associated with ultra-luxurious safaris on the African continent. This reputation was built by keeping their lodges and camps exclusive and by maintaining a high level of service. 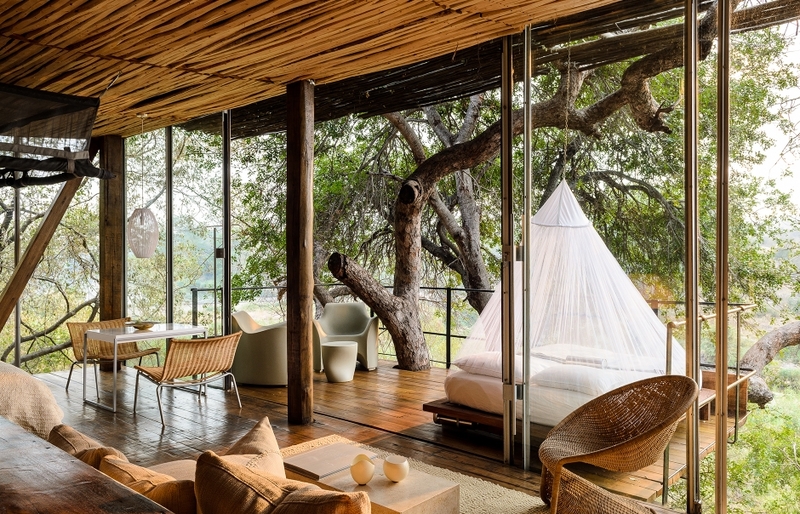 Singita Lebombo, of South Africa’s Kruger National Park, is an excellent example. 15 individual loft-style suites overlooking the N’wanetsi River await guests who can opt to spend a night on their private balcony, on an open-air bed—with only mosquito netting between them and the outdoors. The Loisaba star beds are instantly recognisable—basically, they are four-poster beds on wheels, located on two raised platforms. Both are located at some distance from each other and from the lodge’s main house. This star bed experience is organised as a whole “expedition” which includes a journey on a horseback or on a camel (or by 4×4). A team of traditionally dressed Maasai, who guide and host the guests, prepare a barbeque style dinner and roll the beds out onto the wooden platforms. 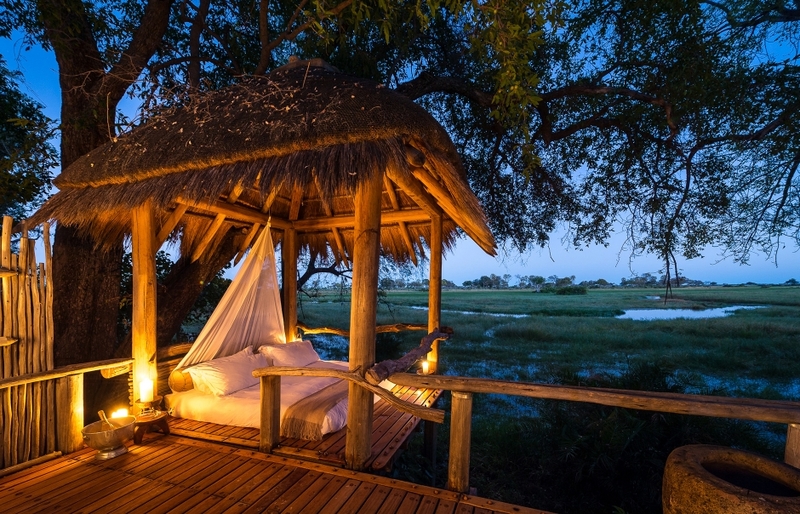 The Star Bed option proposed by Abu Camp in Botswana’s Okavango Delta does not compromise on comforts. This two-floor platform sports a proper field bathroom on the lower level (with shower, toilet, basin), and a large bed draped with mosquito netting on the upper floor. The silence of the night here will no doubt be filled with low grunts and snores of elephants—the star bed overlooks an elephant boma. Malori means “dreamer” in Tswana, but even without this priming, the guests here will have no problems to get on with the program—of indulging in the thrill of sleeping under the Kalahari Desert sky. And once again, this is by no means just camping out. Instead, there is a raised platform partly covered by a thatched roof, a king-size bed and a lounge couch with pillows—and a sumptuous dinner readied by a private chef. One: book a stay at the luxury lodge ol Donyo in Kenya’s Amboseli region. Two: ask for a rooftop terrace four-poster bed set up. 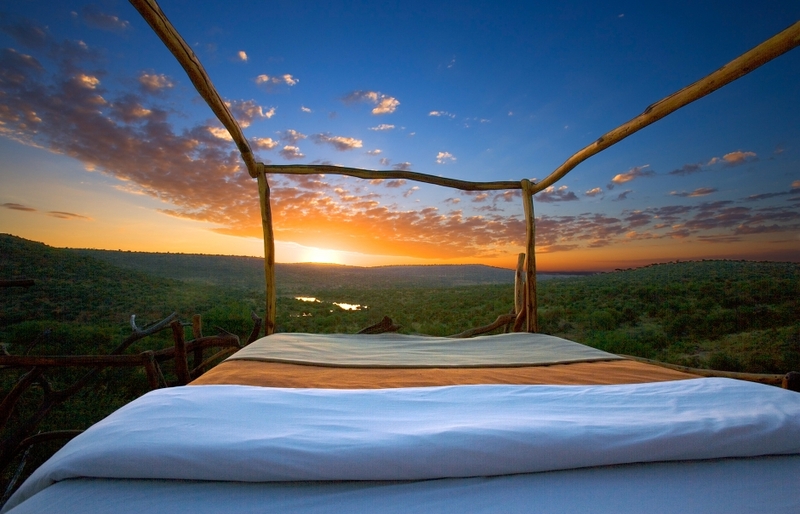 Three: wake up with the view of Kilimanjaro. Sounds like a good plan to us. Of course, there is more to ol Donyo than Kilimanjaro in the morning light. Africa’s highest peak dominates the view, but the plains and hills surrounding ol Donyo ensure great vistas in all directions. The lodge is a worthy addition to the landscape—its interiors wow with contemporary design infused with the rich Maasai culture. This beautifully-designed camp offers only nine tents. They come with indoor and outdoor showers and a private sala, which can be set up for sleeping outside. A raised platform located some 20 minutes from the camp (a wildlife observation deck during the day) can also be prepared for a night in the wilderness. Believe us when we say: the Namib Rand Reserve is one of the most beautiful corners of the planet—and the night sky and the sunrises here are spectacular. We know this because we stayed at two Wolwedans camps. A walking distance from one of them, the Wolwedans Dunes Lodge, is the Mountain View Suite. It’s an exclusive, secluded pad set up on 200 square metres. 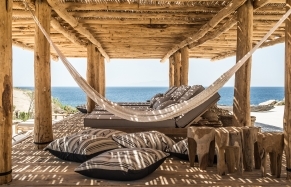 It includes a veranda with the ‘star-gazing’ bed. Best to enjoy in the summer—the nights in the Namib Rand can get chilly. Read our reviews: Wolwedans Dunes Lodge and Wolwedans Boulders Camp. 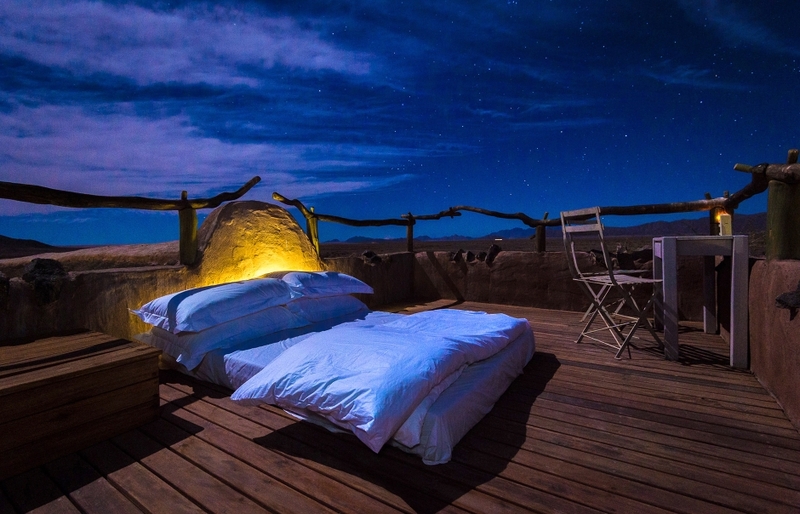 See Wolwedans In Our Lens: Dunes Lodge by T+S and Boulders Camp by T+S. Sanctuary Makanyane Safari Lodge invites discerning travellers with eight luxury wood-stone-thatch suites, designed with floor-to-ceiling windows which ensure beautiful vistas of the Marico River. More interestingly, the lodge also offers a raised platform furnished with outdoor beds. 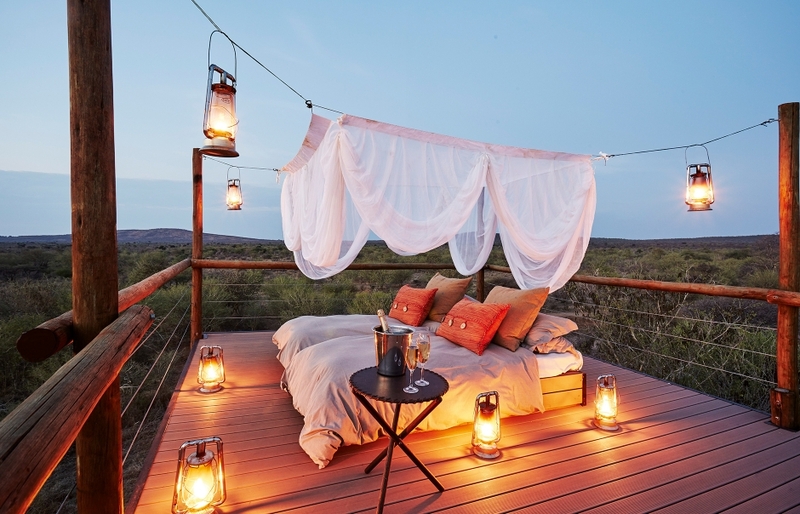 The platform is set away from the suites and is surrounded by verdant nature of the Madikwe Game Reserve. 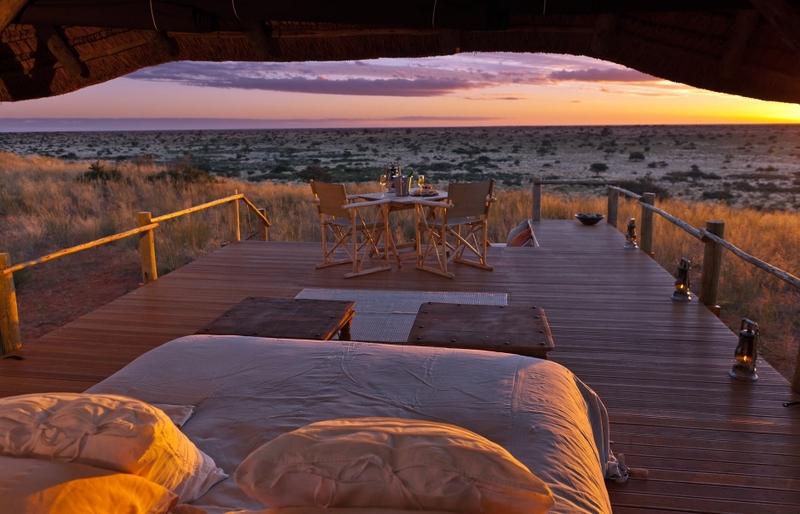 andBeyond is a well-known brand of exclusive, beautiful safari lodges. Xudum Okavango fits the brief. 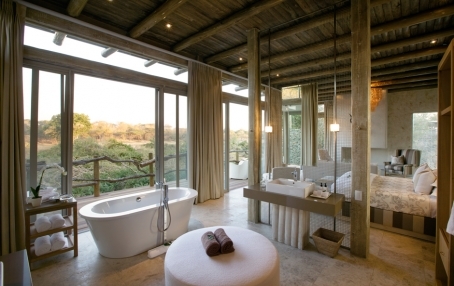 Its nine safari suites are built over split levels, with a plunge pool and en-suite bathroom that includes a large bath. This luxury lodge also offers an elevated sala offering great views over the waterways. The hideout can be arranged for a sleep-out close to the African nature. “Africa is etched deeply in the DNA of all of the mankind. The best way to experience this is to immerse yourself in the sights, smells, sounds and feel of the night […]. As you drift off to sleep you briefly contemplate how strangely familiar it all feels and yet how far away you are from the life you lead.” — Mark Witney, COO at Singita. If discovering the magic of a 130,000-acre wilderness of the Malilangwe Wildlife Reserve in Zimbabwe sounds like a ticket, then Singita Pamushana might just be the right lodge to visit. Plus, Pamushana is perfectly suited for stargazing, with its advantageous position atop a mountain overlooking the Malilangwe Dam lake. Guests can also sleep in the knowledge that all proceeds from the lodge benefit conservation and development programmes in the local area.